L ot’s of people always ask what I do on the weekends while Kyle is at practice. Well most of the time it is not super exciting stuff like answering emails, doing call-ins for different events, schoolwork or other such stuff. A lot of times I will do workout videos or go for a walk with the girls. Sometimes though, racetracks have a really cool kid/fan zone area that I cannot keep myself away from! As Kyle and I were driving into Michigan International Speedway I saw this awesome kid zone that had a trampolines with bungee contraptions on top and I knew I would have to check it out before the weekend was over! I brought Jacquelyn Butler, David Ragan’s girlfriend, out with me to have some fun! Not only was there a trampoline, there was a rock wall, slides, some rotating NASA-used ride and big clear balls! Ha had to say that because I am obsessed with Wipeout and the big red balls so when I saw two clear ones that we could actually get in I knew we were going to have a BLAST. The first thing that Jac and I tried was the trampoline bungee. 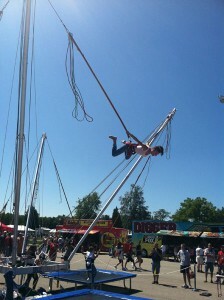 They strap you in a harness and you hang on to the bungees and jump as high as you can. It is crazy how high in the air your can get! We had a blast and I even did a back flip! The next fun attraction we had to try was the big clear balls! 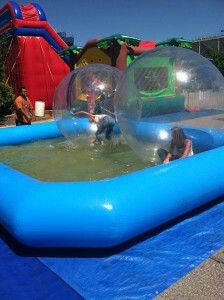 Literally, you get in these gigantic clear balls and they roll you into a kiddie pool. Sounds like it would be easy but no not so much, we could not keep our balance if our lives depended on it! It was a lot of fun to try tho and I think the crowd got a pretty good kick out of us busting our butts. The big slides were the next stop on our fun zone trip. After waiting for the 10 year olds to finish up the big kids took the stage! Needless to say, we screamed all the way down and the kids laughed and were calling us chickens but hey all in good fun! The people running the fan zone area challenged Jac and I to a rock wall climb race. So we suited up and hit the wall! It was neck and neck most of the way but in the end I pulled ahead to take the win. WooHoo!! Hey it’s not only our boys that are competitive! Finally, I got on some crazy Vortex ride. I can not even explain this thing that has three different colored orbs. They strap you in the middle and you spin upside down, backwards and all sort of crazy ways. Apparently, it used to be used by NASA. I gave it a try, screamed the whole time, but in the end it was awesome! Check out my video to see our whole adventure! That’s AWESOME. as i saw on a T-shirt. growing older is mandatory, growing up is optional” wish i could find some cool fun like that.